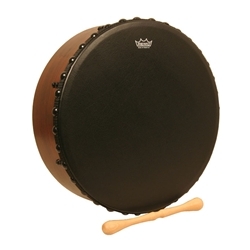 Remo IRISH BODHRAN, 16", Bahia Bass with new deep shell. Each drum is fashioned with an internal tuning system and a synthetic Bahia Bass drumhead. The Bahia Bass drumhead produces a soft attack and deep bass tones and is pliable to produce pitch bending notes. Remo’s Irish Bodhran’s include a hex tuning key and tipper drumstick. The Bodhran is the historic drum of Ireland and is the primary rhythmic accompaniment for the folk music of the Emerald Isle. The Bodhran’s are typically low pitched and is played with a double headed wooden mallet called a cipín, tipper, or beater.